Theresa May's Conservative conference speech heralded a new vision for Britain. 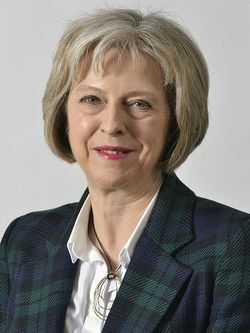 She sounded bullish and confident as she outlined her new vision with the words "A truly global Britain is possible, and it is in sight." This new vision will require a radical change in thinking. For forty years, we have assumed that our future would be within European Union constraints, but now that is no longer the case. Many people don't like the idea of making this change, and they are fighting it. "Even now, democratically-elected politicians say that the referendum isn't valid, that we need to have a second vote. Others say they don't like the result, and they'll challenge any attempt to leave the European Union through the courts. But come on. The referendum result was clear. It was legitimate. Brexit means Brexit - and we're going to make a success of it." To achieve success means we will all have to undergo a change of attitudes and a change of plans. May said "(Brexit) was the biggest vote for change this country has ever known"
And in order to manage change, we may need to change our mind set. We need to be comfortable - no, MOTIVATED - by the prospect of change. We need to alter our attitudes to CHANGE, because all improvement implies CHANGE. Most people want things to get better, but for nothing to change. People want everything to stay the same, but get better. In order to make The NEW Vision for Britain a brilliant success, we need to develop our change management skills. Change management skills are as follows. Recognition of the fact that: Change is inevitable. Change is the only constant. Given a constantly changing environment, how can we get the best results? Take back control. Make Goal-directed purposeful changes. The first step to change management is deciding "What is the target, the goal?" The second step to change management is deciding, "What is the plan?" The third step to change management is managing the negative emotions that change often induces in many people. Emotions of fear, uncertainty and anxiousness. The next step is: Replace the negative emotions with positive emotions of excitement and confidence. The next step is to observe the results of your actions, and use this information as feedback. The next step is to become comfortable with making continuous adaptive changes based upon the changing context, the feedback and the goal. We need to be happy to live in a constantly changing environment. If you would like to train yourself or your team on how to manage change and get the best from the New Vision, please take a look at our one-day in-house Change Management Training Course. Some people take change in their stride without breaking a sweat, others have more trouble. Take our free Change Management questionnaire to see how well you are set up to deal with the pressure of change. Once you have set your goal, don't forget to measure your progress and act on feedback. Feedback tells you how well you are doing, and whether you need to make any adjustments to achieving that goal. Why Won't People Accept Change? Why won't people accept change, even when they can see that what they are doing does not bring them what they want? Theresa May promised at the Conservative conference that "a change has got to come" as she outlined her vision for Britain. This new vision will require a radical change in thinking.